In tenth pAsuram, AzhwAr says “It is apt to serve polindhu ninRa pirAn who has mercifully descended without losing any of his aiSvarya (wealth/control) and standing [here in AzhwArthirunagari]”. Subsequently, AzhwAr says “It is both destiny and apt to serve emperumAn who is the SarIri (soul) of all, very easy to mingle with and is having heart captivating activities”. uRuvadhu Avadhu – the purushArtham (goa) that is destiny and apt. emperumAn is standing in such a manner that all categories of dhEvathAs, all worlds, other chith (sentient beings) and achith (insentient entities) and all of these remain in his svarUpam, considering them to be distinguished forms as comparable to his divine/special forms, without losing his identity as well as his characteristics; he is also standing in thirukkurugUr which has fertile lands having well growing fresh paddy, sugarcane etc; to serve such emperumAn who having great enjoyability forever as vAmana, assuming the form of brahmachAri and as krishNa who performed kudak kUththu, is the purushArtham (goa) that is destiny and apt. uRuvadhAvadhu … – It is apt to serve the one who performs great kudak kUththu (pot dance). This [servitude] is apt, suitable, best and joyful; it can simply mean “this is apt”. eththEvum … – All the dhEvathAs and the worlds which are their abodes. maRRum – the remaining chEthanas (sentient beings) and achEthanas (insentient entities). than pAl maRuvil mUrththiyOdu oththu – When they arrive at him, they will be considered as his faultless forms. When they become his forms, they will be as good as his divine/spiritual forms, and remain faultless. maRu – fault; maRu il – not having fault. That is not having the possibility of being separable from him and so on. Another explanation – maRu – mole – SrIvathsam; the form of emperumAn which is having the SrIvathsa mole; [these entities when united with emperumAn] will resemble the divine form of emperumAn which is having the SrIvathsa mole. Another explanation – there is a form of empeurmAn which is opposite to all faults; matching such form. How are they comparable to his SarIram (form)? This is due to them a) being inseparable b) having AdhAra (emperumAn being the support) – AdhEya (other entities being supported) relationship c) having niyanthru (other entities being controlled) – niyAmya (emperumAn being the controller) relationship, having SEsha (other entities being servitors) – SEshi (emperumAn being lord) relationship, all of which are characteristics of SarIra (body/form) and are present in these entities with respect to bhagavAn. When dhEvadhaththa (an imaginary person) stands on a tree, that tree does not become his body – here it is not like that [emperumAn is pervading everything, so everything is his form]. iththanaiyum … – While all of these remain in him as they are. emperumAn descending into AzhwArthirunagari having all entities other than himself being servitors in the form of SarIra (body), and without losing any of this wealth/opulence. 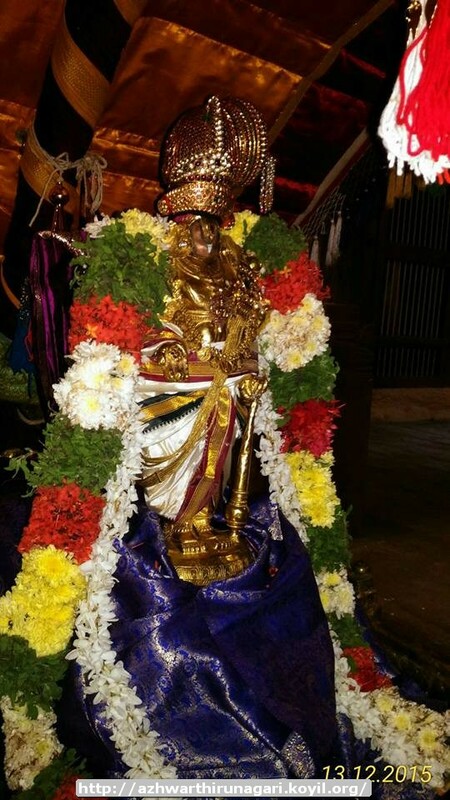 Since emperumAn is together with ubhaya vibhUthi (nithya vibhUthi (spiritual realm) and leelA vibhUthi (material realm)), he is standing here manifesting all those wealth. A prince, even while wearing a small garment and appears modest, it will manifest his wealth without any shortcoming. seRuvil … – In the fertile fields of thirukkurugUr, the fresh paddy crop grows as high as sugarcane crop. In this town, the entities are equally great and have no shortcomings; just like in paramapadham, everyone will have the same greatness. kuRiya – Just like a huge land is shortened into a small space, he presented himself in a short form which can be fully absorbed and enjoyed by one’s eyes. mANuruvAgiya – He is an expert in begging that he will have the same fresh smiling face whether some one gives alms or not. nIL kudak kUththanukku – Even after performing the kudak kUththu long back, he danced in such a manner that, even those who hear about his dance, will completely be captivated as if they saw it right in front of them and start loving him. AL seyvadhE – That kudak kUththu chEshtitham (leelA, activity) will itself engage you in servitude; you just need to oblige. This entry was posted in thiruvAimozhi, thiruvAimozhi 4th centum on May 7, 2017 by Sarathy Thothathri.